← Hillary Clinton: I’m ‘Wonder Woman’ too! On June 18, despite mourning the recent killings of a dozen of Muslim Kashmiris by Indian Occupation Force (IOF) in India’s annexed state of Jammu and Kashmir – firecrackers were bursting all over the Valley as it erupted in celebrations over the unexpected victory of Pakistan at the Oval (London) in the ICC Champions Cricket Trophy. Thousands of people including elderly, women and children came out on the roads and streets across the Kashmir valley to join the celebrations of Pakistan’s victory over arch rival India. Amid pro-Pakistan and pro-freedom slogans, firecrackers lit up the skies in occupied Kashmir. The ‘moderate’ Hurriyat chairman Mirwaiz Umar Farooq congratulated Pakistan over the winning the ICC Championship trophy. 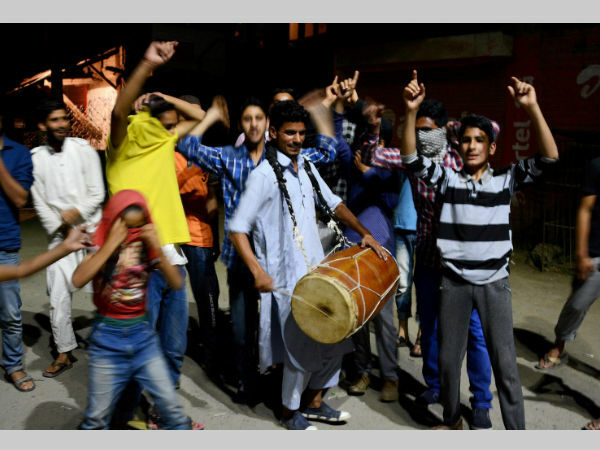 In Srinagar, the summer capital of Jammu and Kashmir, residents accused officers of India’s Central Reserve Police Force of smashing cars and beating up people for celebrating Pakistan’s win. Many residents in India’s only majority Muslim state support Pakistan’s cricket team. A cracker dealer in the city claimed to have sold firecrackers worth Rs 3 lakhs in a matter of some hours, “I was not the only one who opened up Sunday. The demand for firecrackers was huge and we had reserve stock as Eid is coming up,” he said. Indian Hindu reaction to Pakistan’s victory over India was reported smashing TV sets, burning posters (watch video below) while Hindu media branding Kashmiris traitors for celebrating Pakistan’s victory. The only sensible comment I came across, was from a Hindu female journalist Angshukanta Chakraborty. She commented at Daily O India on June 19: “Why it shouldn’t matter if some Kashmiris are celebrating Pakistan’s win against India?“. “The demonstrations of joy and happiness at Pakistan victory happened in England, South Africa, the Caribbean islands, which hardly raised an eyebrow. In fact, East London, Birmingham, Manchester – places with substantial Pakistani immigrant population, as well as South Asians in general, green was the colour of choice for the night.‪But the concerns were poured in because celebrations took place in Kashmir. Valley erupted in joy, read a number of news reports. In Srinagar, Pakistani flags were waved, while crackers were burst. In Tral, victory marches were carried out. In Shopian, Kulgam, Sopore, Baramulla, displays of joy were reported. Some Kashmiris were evidently cheering on the Pakistan victory. Cricket nationalism is a rallying point in South Asia, but when it comes to India and Pakistan, it’s war. Sentiments notwithstanding, this classification of a beautiful game of cricket, postcolonised thoroughly from its imperial origins, into war, actually robs of the many moments of wonderful fuzziness it offers when it’s played and then replayed in our minds, sports pages, cricket columns and now, in the churning sea of social media jokes,” she said.